Do you sometimes have trouble locating files in the directory structure on your computer? Do you wonder where to save a particular new file, or a new piece of information you've gathered from the web or somewhere else? Then personal knowledge management is an issue for you, and the DigitalFriend can help you, big time. Within the DigitalFriend is a powerful file manager, that is much more than a simple file manager. The structure within it represents your Knowledge Tree - your personal taxonomy (or personal ontology - depending on how formal you want to be) in which is held all the files and data important to them. In my own case, it holds every thing I've done, everything I've written, in English and in code in various computer languages, my photos and other images, some videos, my spreadsheets, my lists and adhoc notes, various HTML files and various other 'content', since 1986. i.e. I don't generally store programs in there, well, not installed ones, but there are some downloaded installs. In addition, the same hierarchy is used to store RSS items, and it will be used to store email items in aforthcoming update. The Knowledge Tree is the third FUN-oriented hierarchy within the DigitalFriend. Where one holds active agents, another holds the Roles and sub-roles in the users life, this one is a storehouse for the user's resources, in all their variant forms. It is physically held in the client computer's secondary storage - usually hard disk or in memory, depending on the client device (note: the user is also able to sync it with USB, firewire, network and other devices that come up in the computers file space). This hierarchy is the user's Knowledge Tree , which they may structure as they see fit, extending it as deeply as they like. A given sub-directory may have any number of files, and files of any type. In addition to regular files of all kinds, the Knowledge Tree is used to store the local datastores for agents of most sub-agent types. In such a datastore, the first line of a datastore is a schema of the tuples/records that follow it. Those same names of attributes, match the names of their respective terms in the predicates within the agent that is the custodian of a given datastore. I.e. There is a direct mapping between the symbolic level in the agent system, and the knowledge level in the Knowledge Tree. Note: Agents have been used to build Knowledge Management (KM) systems for some time, often as the tools that manage loosely coupled information sources on the Internet . 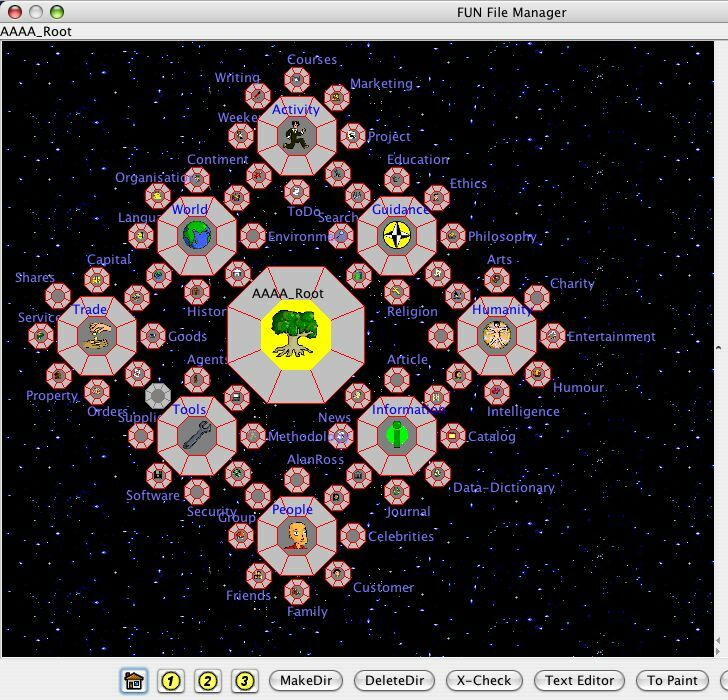 Within the DigitalFriend the Knowledge Tree is displayed via a built-in file manager called the FUN (Friendly User Navigation) File manager. 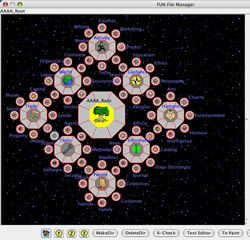 It uses the same octagonal interface employed in displaying both the agent and user role hierarchies. However, the Knowledge Tree is also a designated part of the user's normal file space, so it can be accessed and extended using a computer's standard file manager or interface - e.g. Windows Explorer on a PC, Finder on a Macintosh, and KDE for example on Linux. The use of agents and MAS in KM systems is gaining currency, however, they are largely directed towards KM in organizations, where the organization's goals map onto the individuals who are acting in specific roles: See Dignum . The Knowledge Tree we are concerned with here is based on a personal ontology, and the design of the personal ontology for a given individual, is becoming part of the Shadowboard Methodology - i.e. it is an active area in our current research. Nonetheless, a few points about the current direction of this research are outlined here. A well-accepted and terse definition of ontology is that of Gruber : 'An ontology is a formal specification of a conceptualization.' Ontologies are therefore often the subject of global and shared standards. Dignum  says that a KM System must provide a common knowledge description ' in this way, integration and autonomy are achieved by separating the use of knowledge, from the specific characteristics of the knowledge source '. In our case, with regard to web service orchestration in the DigitalFriend, the WSDL language gives us a good degree of such separation, without a directing a global ontology. Heinze  points out that: ' If the ontology is predetermined - as might be the case with the adoption of a global, shared ontology - then the result is a set of constraints over the agent design .' Not surprising then, that individuals are more inclined to avoid standards than are organizations and companies, so the design of an ontology that fits a given individual well, is a very individual-oriented process, and therefore much suited to the ShadowBoard Methodology. Even so, there are widely used, standard-based terms within a given personal ontology, such as book ISBN-numbers . These universal keys become a link between personal ontologies and global shared ontologies. As such it is highly desirable to include such generic keys within an individual personal ontology, whenever possible. It helps significantly with the translation process between the user's ontology and an external ontology of a service they are interfacing with. For example, in matching the terms within an agent that wraps a web service, with the names of parameters that the external web service requires , or returns. It is a good compromise against not subscribing to some externally-defined global ontology. Devising ontologies is a well-established and growing activity in knowledge engineering (KE). However, many of the contemporary issues in that process are cased in the issues of the work organization , rather than issues facing the individual in their 24x7 lives (Of course the two areas of a life often overlap about 8 hours in every 24, over 5 or 6 days of most weeks). For example, coming to a consensus amongst the workers in an organization involved in adopting a new or modified taxonomy may take months. In the ShadowBoard Methodology we are after a consensus of one. It is about the appropriate ontology for the individual concerned, rather than coming to a consensus to serve the many. This freedom has little cost at the directory level of the Knowledge Tree, but, at the term level within the datastores that use external services (and hence terms within the agent), some translation facility or effort is required to achieve interoperability. Currently, in the DigitalFriend that mapping is done within the GUI interface, by the end-user/developer, when they select a web service. The inclusion of more automation here, is being investigated. Similarly, in the workplace, people are often resistant to supplying the functional items (versus the subject items ) in a shared ontology, taxonomy or business classification schema. There is a trust issue. It can depend on the company and the cultural attitude towards the ongoing value of each member of a workforce. In a workplace culture where employees can be quickly culled in down-sizing operations and productivity drives, supplying specific functional details of how one does ones day-to-day work, may be seen by the individual participants, as supplying facits of their expert knowledge, and tantamount to helping make themselves redundant. The ShadowBoard Methodology is generally straightforward when the user has a clear view of the roles, commitments and tasks in their life. However, the bottom-up aspect of the method - particularly when combined with ethnography techniques such as Cultural Probes  - allows for the capture of those less structured and less goal-oriented activities in a life, broadening the applicability of the methodology to most people . Furthermore, the ShadowBoard Methodology for building a digital friend is very much about utilizing third party agents, particularly web services as sub-agents, currently from within the DigitalFriend software tool, but the methodology will also be useful with other multi-agent systems (MAS), when they are applied to bands of Personal Agents (BoPAs), some of which wrap web services. The work on incorporating personal ontology design within the methodology touched on in this page, is at an early stage. Nonetheless, it is already clear that there is potential for conflict of purposes, between an individual and their employer/s. The point made in Section 2 above, of emphazing to the individual that the ShadowBoard Methodology squarely places the interests of the individual foremost, oftentimes clashes with those parts of their life when they are employed by others. Some part of a user's personal ontology will overlap with their employer's official ontology. Similarly, some part of the functionality expressed in the agent hierarchy in the DigitalFriend will echo the functional items in a shared business ontology - the very items that knowledge engineers often have trouble getting from an organization's individual employees. Indeed, ongoing issues in KM include: ' facilitating trust, motivating users to share knowledge and establishing group awareness ' . This would not be a problem in many cases, but in workplace cultures where knowledge engineering is viewed suspiciously, where trust is already a casuality, the end user of a tool like the DigitalFriend, will very much want to be in control of both the development and ongoing operation of it. In this sense, it is fortuitous that the DigitalFriend is currently targeted at end-user development, and that the ShadowBoard Methodology is targeted at the end users themselves, not at the companies that employ them. Annet, J. Hierarchical Task Analysis. In The Handbook of Task Analysis for Human-Computer Interaction, Diaper, D. and Stanton, N. (Eds), Lawrence Erlbaum Associates, 2004, 67-82. Bradshaw, J. Software Agents. MIT Press, 1997. Caroll, J.M. Designing Interaction: Psychology at the Human-Computer Interface, Cambridge University Press, New York, 1991. Dignum, V. An Overview of Agents in Knowledge Management, Proceedings of 16th International Conference on Applications of Declarative Programming and Knowledge Management (INAP-05), LNAI, Springer, 2006. Gaver, B., Dunne, T. and Pacenti, E.. Cultural Probes. Interactions - New Visions of Human-Computer Interactions, pp 21-29, January+February, 1999. Goschnick, S.B. ShadowBoard: an Agent Architecture for enabling a sophisticated Digital Self. Thesis, Dept. of Computer Science, University of Melbourne, Australia, 199 pages, 2001. Goschnick, S.B. & Graham, C. Augmenting Interaction and Cognition using Agent Architectures and Technology Inspired by Psychology and Social Worlds. Universal Access in the Information Society, 4(3), pp.204-222, Springer, 2006. Goschnick, S.B. and Sterling, L. Enacting and Interacting with an Agent-based Digital Self in a 24x7 Web Services World. In Proceedings, IEEE joint conference on Web Intelligence and Intelligent Agent Technology (WI/IAT), Halifax, Canada, 2003. Goschnick, S.B. & Sterling, L. Psychology-based Agent Architecture for Whole-of-user Interface to the Web, Proc. of HF2002 Human Factors Conference: Design for the Whole Person - Integrating Physical, Cognitive and Social Aspects, Melbourne, Nov, 2002. Goschnick, S.B. ShadowBoard: Revisiting the individual in MAS. Technical Report 2000/6, Dept. of Computer Science & Software Engineering, University of Melbourne, May, 2000. Heinze, C. Modelling Intention Recognition for Intelligent Agent Systems. PhD Thesis, Dept. of Computer Science & Software Engineering, University of Melbourne, 2003. Johnson, P. Human Computer Interaction: Psychology, Task Analysis and Software Engineering, McGraw-Hill International Ltd, UK, p.114-33, 1992. Kay, J. and Thomas, R.C. Personal Usability Based Upon a Scrutable, Dynamic, Individual User Model, In Proceedings of OZCHI-2000, Sydney, Australia, pp.292-8, 2000. Kinny, D. and Georgeff, M. Modelling and design of multi-agent systems. In J. P. Muller, M. Wooldridge, and N. R. Jennings, editors, Intelligent Agents III (LNAI Volume 1193), pages 1-20. Springer-Verlag: Berlin, Germany, 1997. Klusch, M. (Ed. ): Intelligent Information Agents: Agent-based Information Discovery and Management in the Internet. Springer, 1999. Rosson, M.B. and Carroll, J.M. Usability Engineering: Scenario-based development of human-computer interaction. Morgan Kaufmann, San Francisco, 2001. Scerri, P., Pynadath, D., and Tambe, M. Why the Elf Acted Autonomously: Towards a Theory of Adjustable Autonomy. In, Proceedings of the International Conference on Autonomous Agents and Multi-Agent Systems, 2002. Wooldridge, M. and Jennings, N. Intelligent Agents: Theory and Practice. Knowledge Engineering Review, 10(2), pp 115-152, 1995. Wooldridge, M., Jennings, N. and Kinny, D. The Gaia methodology for agent-oriented analysis and design. Journal of Autonomous Agents and Multi-Agent Systems, 3(3):285-312, 2000. Young R.M. Surrogates and mapping: two kinds of conceptual models for interactive devices, in Mental Models, Gentner, D. And Stevens, A.L. (eds), Lawrence Erlbaum Associates, Hillsdale NJ, 1983. Zukerman, I. An Integrated Approach for Generating Arguments and Rebuttals and Understanding Rejoiners, Proc. of the 8th International Conference on User Modeling, 2001.